No need to worry about consumables, treatment time is short, and it is particularly effective for acne redness. The method of using laser for acne treatment has started to meet the patient’s needs of a variety of treatment methods and the economic needs. 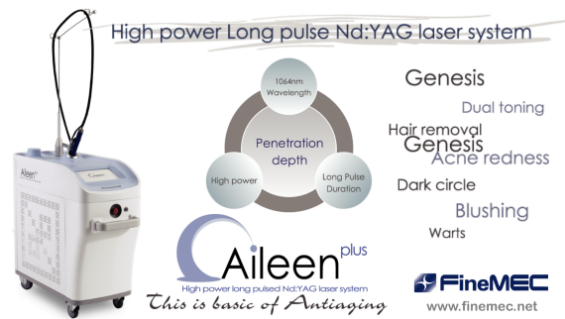 If you are not having all kinds of lasers to treat acne, it would be better to use Aileen for acne treatment, because of short treatment time and no worry about consumables. I’m sure that Aileen is very good for inflammatory acne and acne red scar though it seems that it is not good for comedo nevus. As treatment method for acne, the oral medication is possible together with treatment. Otherwise, it is also possible without oral medication. In my own opinion, I prefer using oral medication together. Of course, it could be used together with other acne skin cares, but for the patients suffering from inflammatory acne, the treatment results would be much better. For acne, operator can use a handpiece at 5mm diameter and according to lesion, you can chose 10ms ~ 20ms with 80J ~ 120J. The important point is that operator should lower the output energy in case of serious inflammation or if the pustule has blood in it. Aileen is more suitable for the treatment of acne erythema than use for acne by itself. Additional treatment (two or three times) is needed for better results. Usually, after acne disappears, operator can treat acne erythema five times at minimum to eight times at maximum. The treatment interval is every two weeks and it may start at 5mm spot and 5ms 100J. After only one time treatment on erythema, operator can do the Genesis Toning about 2,000 shots overall. Treatment compliance is very good even after only one time treatment because of a bit of improvement.